SPACE CAPTAIN: Captain of Space!, directed by Lindsey Moore Sproul of No Tea productions, at the Kraine Theater in the East Village until Saturday September 15th, depicts a 1930s themed pulp action space adventure, told through an interesting mix of different mediums including live theater, film, and puppetry. A great theater experience and all around humorous time, the play begins like an old news reel, with cast & crew credits on screen before going even further and setting the story with a very familiar ‘star wars-esque’ crawl leading directly into a space battle. Enter puppets, great sound effects, and a very creative action sequence that flowed between mediums. Indeed, the low-fi quality of the film production actually added to the immersion of the story. Once the live sequences began, there was a feeling of seemlessness as the actors were done up with interesting black and white make up, costumes and physical mannerisms. A character driven tale, the stereotypical tropes of the male action hero, fainting female love interest, know-it-all doctor, spunky sidekick and evil buffoon of a villain were very much on display. Great performances by Matthew Wise as the heroic Rocky Lazer, Alicia Barnatchez as the damsel Prof. Jean Jarvis, Jeremy Mather as the hilarious Chip Skipper, Jeff Sproul as the evil King Xyno, and the two ladies who stole the show; Michele McNally as Princess Astra and Sabrina Farhi as Lady Actulus, the Space Oracle. Definitely check this one out if you like good old timey pulp action with a modern edge and with an actual take home moral. 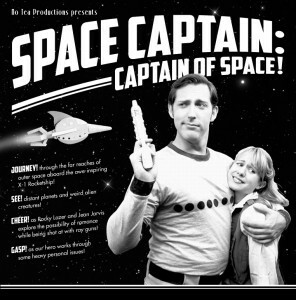 SPACE CAPTAIN: Captain of Space!, directed by Lindsey Moore Sproul runs at the Kraine Theater in the East Village until Saturday September 15th. For tickets, please visit http://www.noteaproductions.com/index-V2.htm.